City-dwellers would probably agree that cities are the best, but when it comes to greenhouse gas emissions, they’re pretty much the worst. Cities consume over two-thirds of the world’s energy and account for more than 70 percent of global CO2 emissions, according to the C40, a coalition of cities that have banded together to address climate change. More than 60 percent of we humans are expected to live in cities by 2030. Consequently, cities – and their mayors – have a lot of power to make change by passing laws and regulations that govern mass transit, buildings, waste… all the basic stuff that makes up the bulk of our everyday lives. 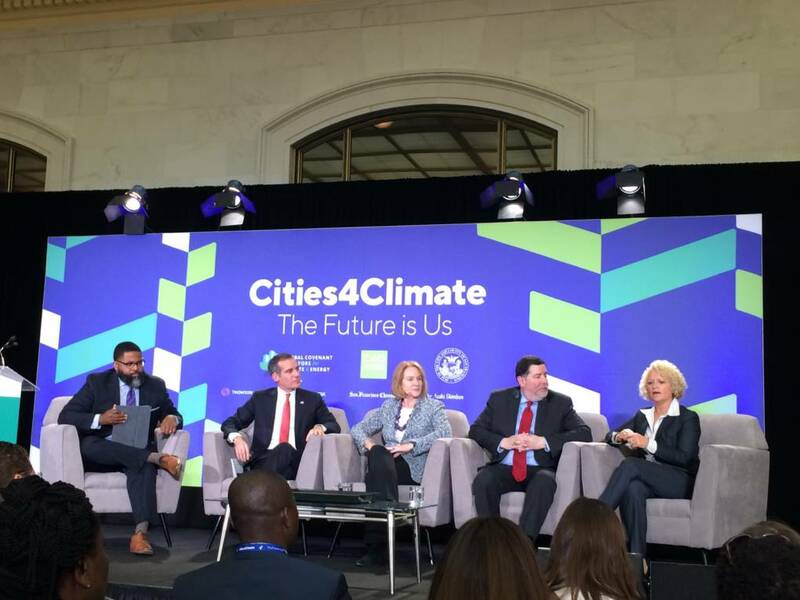 A C40 event, entitled ‘Cities4Climate: The Future is Us,’ sought to highlight some best practices at San Francisco’s City Hall on Wednesday. It was a prominent affiliate event at the Global Climate Action Summit. More than a dozen mayors from around the world took turns describing how they’ve solved problems in their own backyards. A sprinkling of special guests like former Vice President Al Gore added a dose of inspiration to the proceedings. Pennsylvania, a coal and fracking state, isn’t about to make a landmark commitment to 100 percent clean energy by 2045, like California Governor Jerry Brown did this week. But Pittsburgh Mayor Bill Peduto highlighted an innovative “microgrid” technology initiative, which would keep energy that’s sourced locally – including from solar and wind sources to be deployed in city limits – within the city, making the energy itself more sustainable. “Energy companies are partnering with city because it’s about the future,” said Peduto. He mentioned that the city had gotten help from a team of engineers from Denmark. As many as 1.2 million avoidable deaths are caused by air pollution each year, according to the C40. In Paris, there are 2,500 preventable deaths a year from the scourge of tailpipe pollution from cars, particularly diesel. Paris has pledged to ban diesel cars from city limits by 2025 and has since announced it will phase out all but electric cars by 2030. Los Angeles has pledged to phase out all but electric cars by 2030. “As elected leaders, we know how hard is it to convince stakeholders that acting on climate is a top priority,” said Paris Mayor Anne Hidalgo, who has gotten some pushback from Parisians about controversial street closures she has pushed through. Cars are essential in Dubai, so banning them is out of the question. But Abdulla Al Basti, Secretary General of the Executive Council of Dubai, told the audience that by 2030, 25 percent of those cars (and buses) will be 100 percent autonomous and electric. The Dubai Autonomous Transportation Strategy is projected to reduce the city’s transportation costs by 44 percent, including the need for parking spaces. It should reduce accidents, and reduce overall air pollution by 12 percent, said Al Basti. San Francisco got schooled by the mayors of Copenhagen and Seville. Copenhagen, of course, is a bicycle mecca. It has more than 220 miles of separated bike lanes, and they have a reputation for safety – which is why you see parents transporting their kids to school, not to mention professionals and retirees. But it took two decades to transform the thinking around biking to work in that city. And $18 million in the last decade alone, according to Mayor Frank Jensen of Copenhagen. “It starts when you’re a kid. Your parents bike with you to school and it’s a lifestyle you continue to adopt,” he said. He city has moved on to a new phase and is partnering with the suburban cities that surround it to build a series of “superhighways” around the city center, to ease commute congestion. An interesting factoid emerged regarding gender and city cycling. 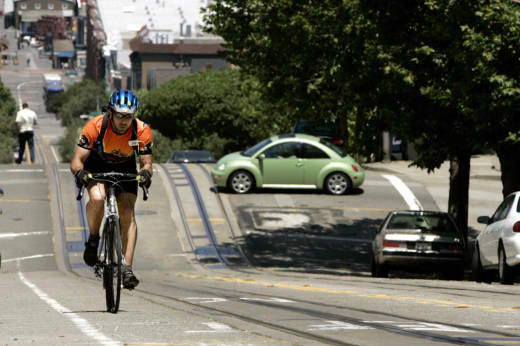 Debbie Raphael, Director of the San Francisco Department of the Environment, revealed that women make up only 25 percent of all cyclists in San Francisco and speculated that safety concerns might be part of the problem. Copenhagen has gender parity in its cycling population. There’s a new buzzword when it comes to buildings: decarbonization. It means that buildings are no longer a net producer of CO2, and the city of Vancouver has a goal to decarbonize its entire building stock (including housing) by 2030. The issue of affordable housing is a real challenge when buildings have fancy design elements that can help with sustainability but drive up cost, said Vancouver Mayor Gregor Robertson. “It’s the question of, ‘We just need to build anything so people have places to live’… versus, ‘We invest in the most energy efficient housing we can.’” In reality, though, “the capital at the front end is more than offset by the savings,” he added. San Francisco has set itself a goal to decarbonize all its new buildings by 2030. The Mayor of Hong Kong, Wong Kam-sing, described how his city has been able to drastically reduce the carbon footprint of its ultra-dense housing. For one thing, only a third of Hong Kong’s land mass is urbanized. Seventy percent of Hong Kong is comprised of rural land and country parks. Half of Hong Kong’s population of seven million resides in government-owned housing. And the city’s public housing department requires all buildings to commit to an LEED-certified gold standard or higher. “We have one of the most livable cities in the world,” he said. If San Francisco were to follow Paris’s lead and ban all but electric cars, that would be a huge help. But it’s not cities like San Francisco, Paris or Pittsburgh that will be pumping out the heaviest C02 emissions going forward. It’s the megacity hubs of developing countries, which have inherited some of the most polluting industries from developed countries, and are also adopting energy-intensive lifestyles like ours. The International Energy Agency estimates that 89 percent of the increase in C02 emissions from energy use will come from developing countries like China and India. 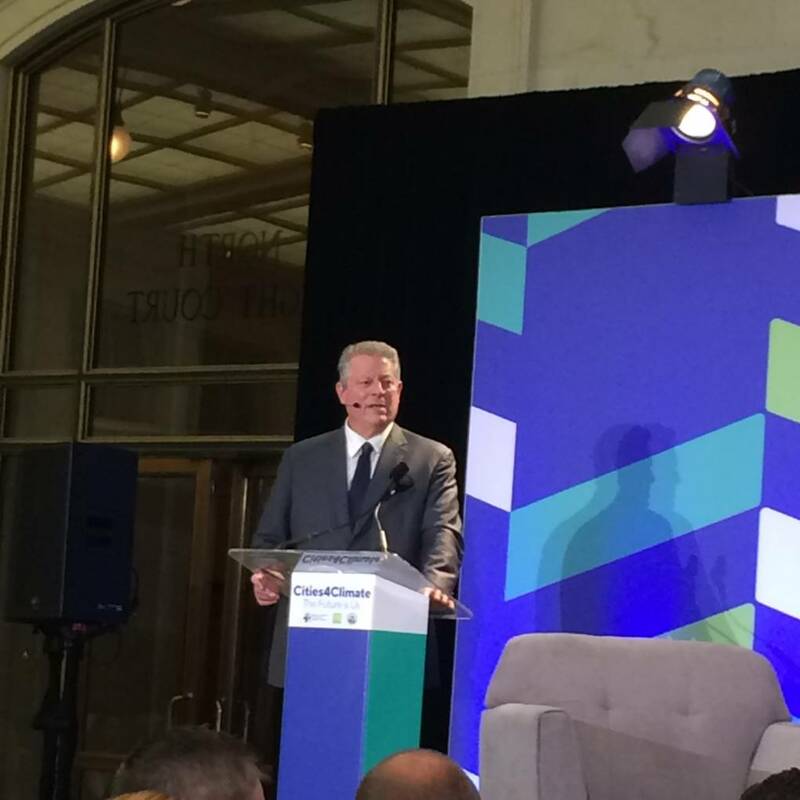 Former Vice President Al Gore sounded the challenges to come in a keynote speech at the event’s conclusion.